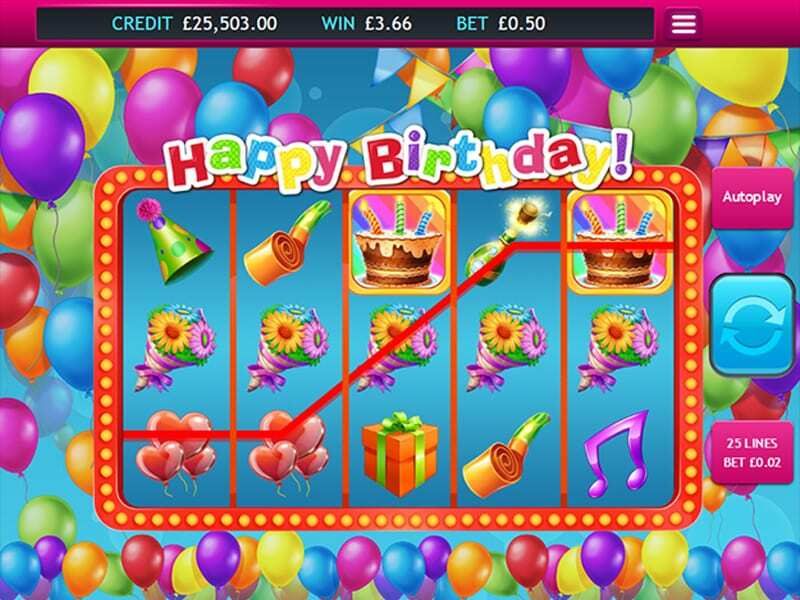 Try your hand at the online gaming slots version of an early birthday present with Happy Birthday, the balloon themed 5 reel, 25 payline. This low volatility slot offers the chance to win a jackpot 9500x your original stake. Join into the fun and come play onlines slots. In 1997 Eyecon was founded and as a computer games company. Two years later they decided to build their first online casino system and in 2003 they brought their first slot games onto the market. Since then they have built a large repertoire of games. They have become extremely popular amongst their audience as you can feel in their games that the Eyecon development team loves what they do and deliver high-quality entertainment. Get the glasses of champagne and open a bottle of the finest bubbly, as Happy Birthday has come to celebrate and get this party going! 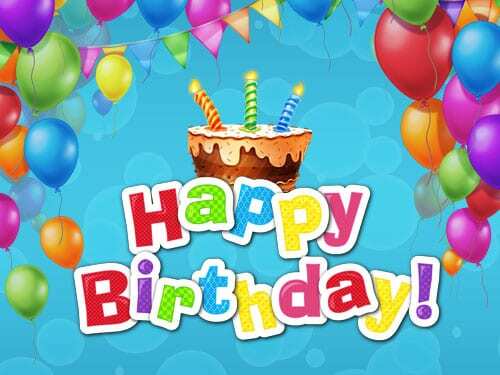 If you have anything special to celebrate then Happy Birthday is a great way to do that. This festive online slot is all about celebrations. You will find a very colourful screen filled with balloons in the background. The art style feels very smooth and simple, making it very easy to keep track of everything. Additionally, this is only some of the most popular slots to play here. Accept the invite and join this party! Over the 5 reels and 3 rows, you will find everything you will need to start the celebration. There are blowouts, nice gifts, party hats, musical notes, bunches of flowers, sweet cupcakes, cute heart-shaped balloons, filled champagne glasses and bottles of bubbly. The cuddly hippo and panda are the high-value symbols and will pay up to 950 coins. There are also some other bonuses to make this party even more eventful and exciting. With the wild streamers symbol, you can replace all other symbols but the scatter and if you have one wild in a payline it will double the payout. If you are able to land more than one wild in a payline you can get up to 9.500 coins. There’s online one thing that needs to be at a party? An enormous birthday cake! This delicious symbol is the scatter and landing three or more anywhere on the reels will award you with 15 free spins with all payouts trebled. You can also re-trigger another 15 extra spins if you find another three or more cakes in one of the free spins. So blow out the candles, make a wish and enjoy your winnings! To gain entry into the party you will have to bet 25p or up to £12.50, depending on how much cake you want to take home. And with 25 paylines, great wild features and a lot of free spins you will want to make the most out of it and celebrate every spin. Happy Birthday is very simple in its features and lively art style, however, it will give you a party feeling and help celebrate a special occasion. The wild features can be very profitable as one wild is already enough to double your winnings. Presents that can be re-triggered are always the best kind of presents in a free spin feature. Happy Birthday is easy to play and quick to immerse yourself into, Happy Birthday offers a great gameplay experience for everyone to enjoy. Once you're finished with this game then give our musketeer slot game a try.